Take a long look at this map. It’s Downtown Atlanta at Five Points and Underground. Pending approval Monday, December 5, from City Council, any and all of the area in blue, the public streets and sidewalks, can be transferred to a third party at the mayor’s discretion (the technical term is “abandoned”). Let that sink in. Streets at the crossroads of downtown may soon be private property. That means that every car and bicycle on the street, every pedestrian on the sidewalk for a two block radius in the heart of downtown will be allowed there solely at the pleasure of a private company (the legislation allows exceptions for the state of Georgia, MARTA, and utilities companies, but no one else). Who can walk these streets may soon be determined by private security. To our knowledge, such a transfer of public right of way in a downtown is unprecedented. We have no idea. Seriously. We have no idea. The legislation introduced by Councilmember (and presumed mayoral candidate) Kwanza Hall specifically waived requirements for public notification and thirty days to comment. Even Kwanza Hall doesn’t know. When asked about the legislation, Councilmember Hall’s staff member Jay Tribby replied that they didn’t know anything it about and only introduced the legislation at the request of the administration. State law requires that the proposed redevelopment plan for Underground be approved by the local governing body. That discussion would necessarily take place publicly. Those plans were obligated to be made public by May 31, 2015, but that has not happened. Presumably this is related to the sale of Underground to WRS, but what their plans are, again, we don’t know. They’ve never built anything in a downtown environment; our only point of reference is their Wal-Marts and Verizon Wireless centers in suburban style strip-malls. 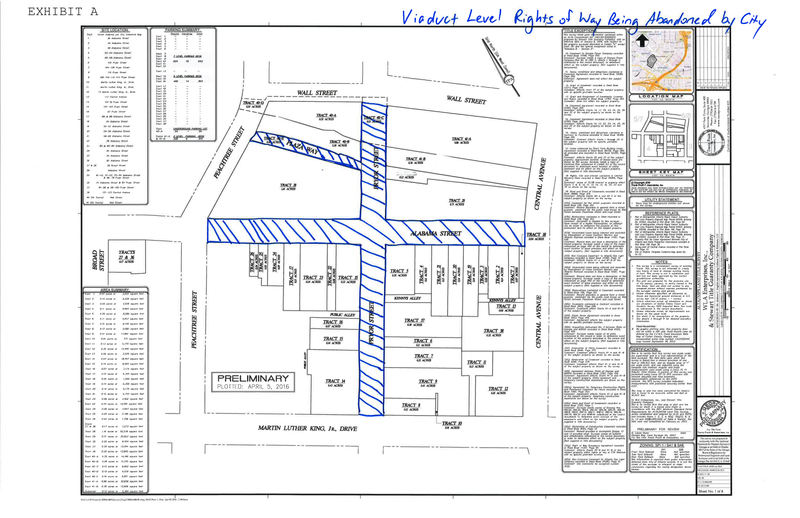 Without any plans, assuming that WRS is not taking responsibility for the $40 million street repair of Pryor, and assuming that WRS’s plans do not include construction of new buildings on the right of way, I am left with the inevitable conclusion that the motivation is entirely to satisfy the developer’s desire to control access to the property. This is a thinly veiled anit-loitering law, except enforcement is private and anyone is instantly potentially trespassing while walking through the area. This should concern all Atlantans. Our Downtown streets should not be private property. The rights of citizens who use them, who walk them after exiting the Five Points MARTA Station, is not up to the discretion of a private landlord who can vacate anyone who does not look like they belong because they are now, legally, trespassing. People of color, beware. Homeless, activists, vendors, street preachers, poor, teenagers… beware. Mayor Reed will, of course, speak Monday before City Council. He’ll speak of the urgency of the sale and how this needs to happen now. That this deal is now in its second year and ample time for input has passed will not be mentioned. And Mayor Reed will say that the city is losing money on Underground, though the city has not made payments on the property since the city’s purchase and bond payments were completed. And Mayor Reed will of course deny that controlling access to the property, excluding undesirables, has nothing to do with this legislation introduced on his behalf. Everyone wants a thriving Downtown and Underground is a key component of that. In no way, shape or form am I suggesting that current management and city ownership should be maintained. The sale of Underground to a private developer, or developers, is desirable. Let a private developer own the buildings. But our streets and sidewalks are our public realm. They are the essential public space of our city. A place where everyone has the right to walk or loiter or speak. To give that up in the name of development is a devil’s bargain. To say that we can only improve Underground by limiting who has access not to its buildings, but to the very city around it is unacceptable. 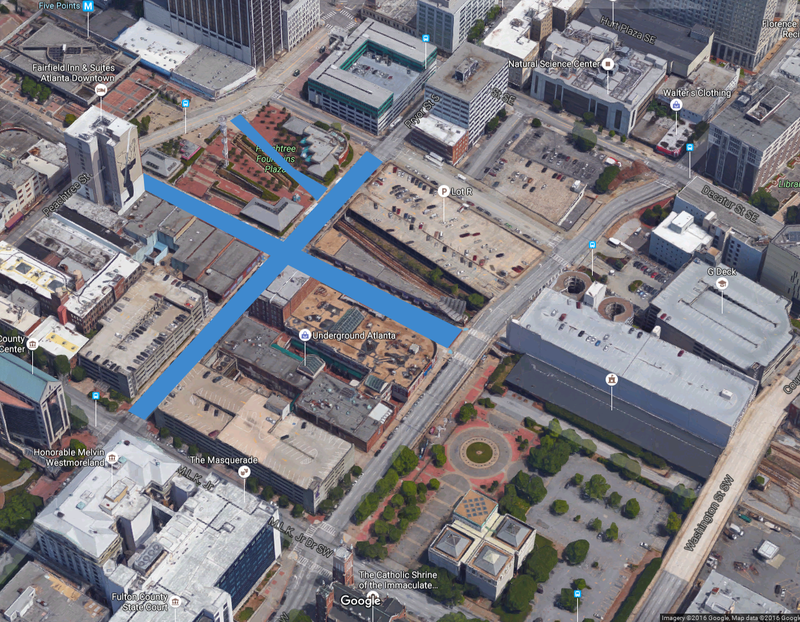 As Matthew states above, Thread ATL is all for the successful redevelopment of Underground. We want it to become a great place. Private ownership of the properties (meaning the buildings and other things off the street) will be a good thing and I’m glad it’s happening. But giving up public ownership of the streets is something else entirely and it raises questions. 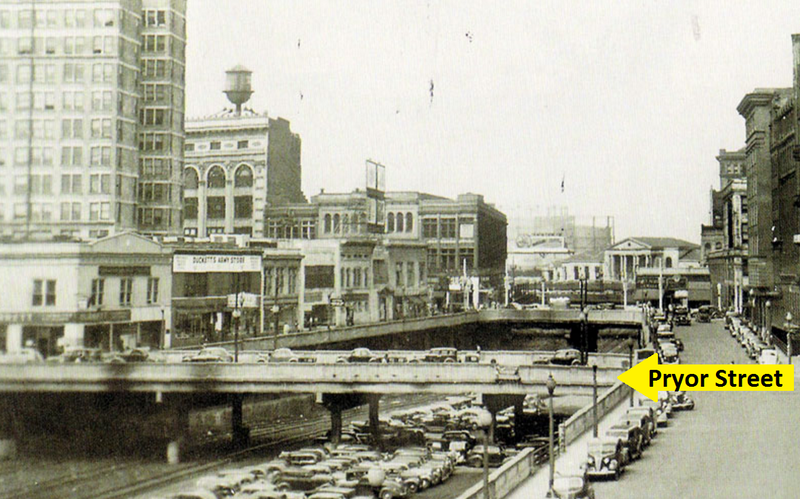 Is WRS, the potential new owner, going to repair a viaduct when it breaks? Can we trust them to keep the streets open and available for pedestrians? Will they maintain good urban design with these routes after they’re no longer the public domain? At the request of WRS, the City of Atlanta traded its publicly-owned Bobby Jones golf course with the state so that it could receive a state-owned parking deck next to Underground Atlanta. 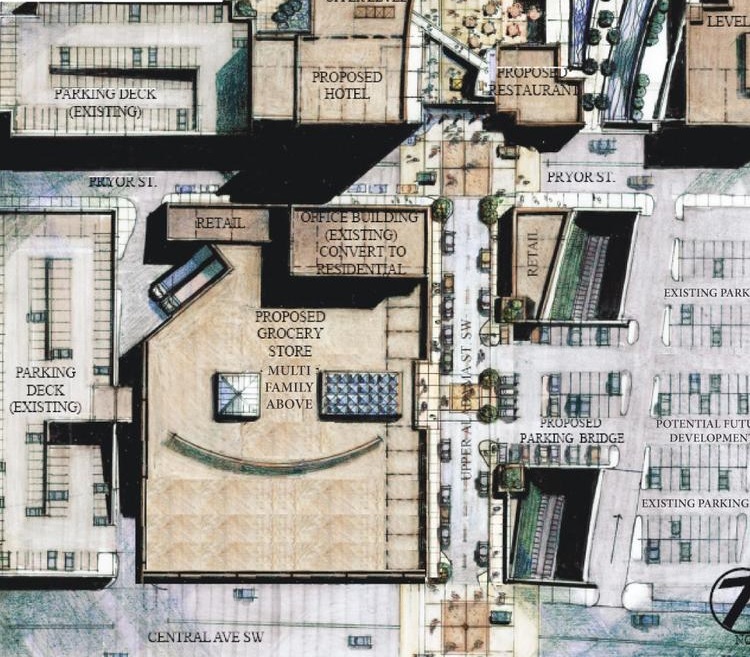 This will allow the developer to put easy parking in front of a giant-sized grocery store (which in itself is troubling — why a suburban-big-box size for this store?). Here’s a rendering from early in the process that shows, partially, the incredible amount of parking this will provide. Does this look like good urbanism fit for a Downtown property on top of a rail transit station? No it does not. And the privatized streets could become nothing more that routes between parking lots, designed for cars to get through and exclusionary to pedestrians. Remove or close Upper Alabama? 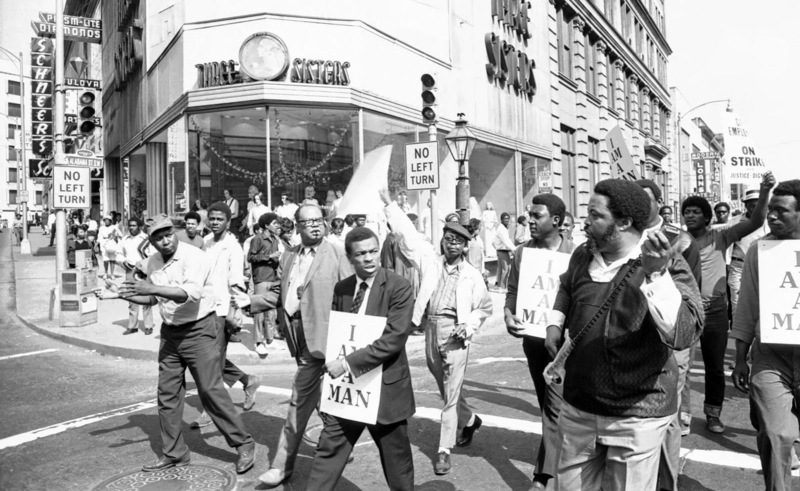 Where so many of the city’s residents have gathered over the years to engage in protest marches for significant causes? What an incredible shame it would be to lose this as a public space. 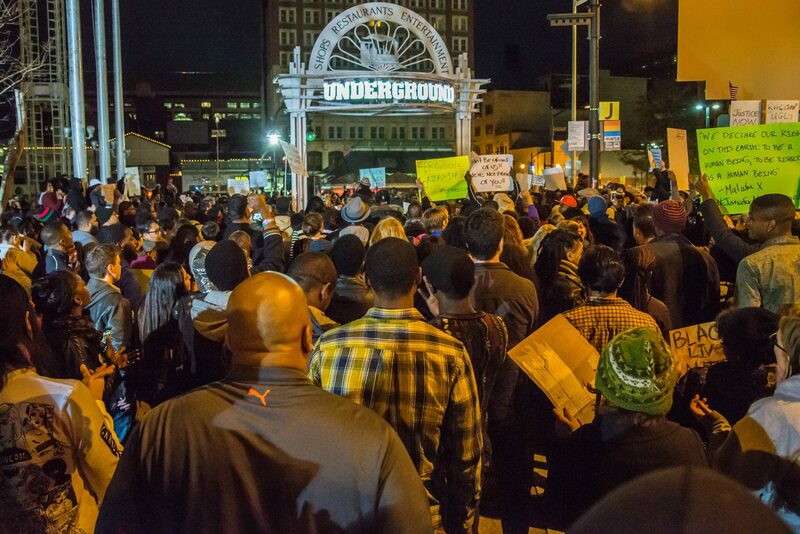 And in this one from more recent years, a Black Lives Matter march begins with a huge crowd on Alabama Street and the surrounding Underground Atlanta plaza. This street and others in Downtown should belong to the people of this city. And what if the Pryor Street viaduct (basically a long bridge spanning the freight and MARTA rail lines) needs to have extensive repair? No private owner would want to pay for that. They’ll get the city to pony up money for it and the public will be on the hook for repair for streets that are privately owned. No thank you. The Pryor Street Viaduct, basically a long bridge that allows the street to cross over the rail tracks on the ground level. With all of these options, the new owner of Underground could cut off the streets completely and make this a “mega block” rather than small Downtown blocks of open streets. That would screw up pedestrian connectivity to the point that car trips could become more viable because of the need to drive around the long way to connect beyond the mega block. And to top it off, the reason we have no idea about what might happen with privatization is because the city hasn’t made the plans public as is required by state law. Is there even a plan? We don’t know, but we should. We want a by-the-book redevelopment with a public process. We as a city lost ownership of Bobby Jones golf course and part of Memorial Park so we could get a parking deck to include in the sales package at the Underground developer’s request. Now we’re giving up public control of streets? With no plan presented to us? That’s just wrong. This deal should not include the risks that are borne by the public though street privatization. The public should reap the rewards of a city, particularly in the historic Downtown neighborhood. A suburban big box store, privatized streets and a potential superblock are not the kinds of investments that give us the return that’s possible here given the context of the Downtown setting.